The Carnival of Viareggio was born in 1873 when there was the first parade of festively decorated carriages in the historic Via Regia, the heart of the old town. It was transferred to the Promenade at the beginning of the twentieth century and it has grown in size and popularity year after year. In 1954 the newly RAI sent his first outside live TV just from the Carnival of Viareggio, making it a big media event. In 1958 the report of the parade was broadcast in Eurovision. Nowadays it is the largest Italian folk event with a budget of € 5 million per year. 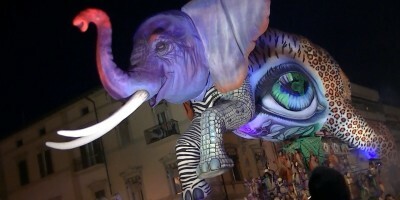 The Carnival of Viareggio fills a whole month of daytime and nighttime festivities with parades of allegorical floats, local parties, masked balls and festivals of all kinds.